The population of brown bears in Slovakia is subject to hunting, using an annual quota system. It is a management tool that is helping society to maintain a balance between the bear population and demand of people. The official annual quota in 2017 is to kill 34 brown bears. The request coming from hunting associations at the beginning of the year was 74 individuals. In reality, hunters killed less then half of the official quota. The quota system is the official tool to remove bears, which supposedly are in conflict with the interest of people, especially if the bears damaged bee colonies, orchards or agricultural commodities. But hunters also use one more argument: safety. The brown bear was nearly eradicated from Slovakia in the 1930s by over-hunting. However, the population has recovered thanks to protection measures and favourable habitat. Genetic analysis estimated there to be around 1,250 bears in Slovakia in 2013-2014 and their numbers are probably still growing. This is good news for conservationists but brings challenges for many people living in or visiting areas with bears. There is therefore a need for constructive dialogue to reconcile conflicting perspectives and find solutions to balance conservation with other human interests and activities. said Robin Rigg, chairman of the Slovak Wildlife Society. He is also an active member of the IUCN Bear Specialist Group, the Large Carnivore Initiative for Europe and the Ministry of the Environment’s working group for the management of large carnivores in the Slovak Republic. There has been a lot of research on bears in Slovakia in the last decade, including at least 3 studies using satellite telemetry collars, and several good quality scientific papers have been published. The challenge is to help local people find ways to live with bears. Extreme views and approaches – from either side of the hunting/protection divide – do not help. Hunters have argued for a long period of time to significantly reduce the bear numbers in order to limit bear-human conflicts. Representatives of the NGO Wolf and other experts, including the European Wilderness Society, have a different opinion. Currently we are solving consequences and not causes. said director of the Polana Nature Park, Slovakia. This year, the NGO Wolf challenged all permits to hunt the bear issued by the Slovakian Ministry of Environment. They argue that the current quota system is not a long-term solution to manage the bear population. The main problem is the current feeding system of hunting game, such as red deer and roe deer. There are tons and tons of food brought to the forest by hunters. We teach bears to eat this food and then complain that he made damages on agriculture production. That is what can not continue. said Juraj Lukas, from NGO Volf. The people are aware that the recovery of the brown bear in the West Carpathians was a success. 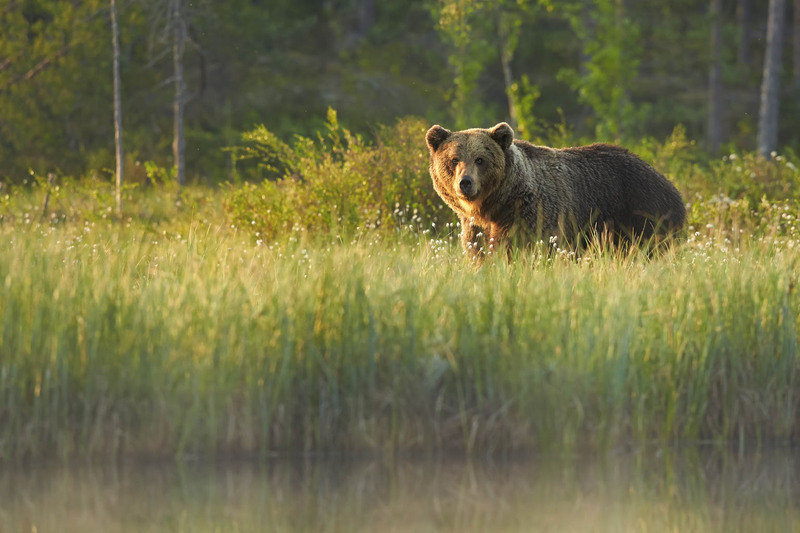 Hundreds of articles in the Slovak popular press, hunting magazines and wildlife management journals describe various aspects of the bear life. Tourism identified with the bears and a new industry developed. And yet, the number of good quality scientific papers published is low. As a result, we still known little about Slovakia’s bears. Looking at Romania and their experience, it is clear that hunting bears never reduced the human-bear conflict situations. We humans must learn to live with these animals and adapt our practices. said Max Rossberg of the European Wilderness Society, summarising the future challenges. Robin Rigg, Chairman of the Slovak Wildlife Society, provided us with several sources of additional information about Bears and other Wildlife in Slovakia. Other articles on bears (as well as wolves and lynx) are available on the Slovak Wildlife Society’s website. thank you for providing this valuable information. We updated the post. It is a pity that most of these studies are published only in Slovakian. On the issue of hunting bears to reduce human conflicts, it seems that there is enough scientific evidence that most human bear conflicts cannot be solved with increased hunting regimes. In fact the latest study from Scandinavia even shows the negative impact of hunting on the genetic variability of bears and thus reduces their long term chance of survivor as a species. Wilderness is an area with no human impact nor extraction including no hunting or game management. Since you only live a few miles away from my home town Liptovsky Hradok, I would love to meet you as discussed a few months ago and exchange our views and learn from each other. So you/Vlado talked to like-minded people and found they agree – no surprise there! More difficult, but also more important and useful, would be to talk to the many people and organizations who hold different views, try to understand them and work with them towards finding common ground and acceptable solutions. Regarding Romania: while hunting did not solve all problems, banning it has aggravated conflicts, which is bad for bears. For large carnivores to prosper in crowded Europe they need tolerance and acceptance, which calls for dialogue, agreement and compromise, not controversial unilateral action. An exception to this could be if a population is critically endangered and requires urgent, radical action to save it, but this is certainly not currently the case with bears in either Romania or Slovakia. Robin Rigg. Chairman of the Slovak Wildlife Society (www.slovakwildlife.org) and active member of the IUCN Bear Specialist Group, the Large Carnivore Initiative for Europe, the International Association for Bear Research and Management and the Ministry of the Environment’s working group for the management of large carnivores in the Slovak Republic. thank you for this info. As our Wilderness Director Vlado Vancura lives in Liptovsky Hradok, he is in touch with several NGOs and they all repeated the same views as published in this article. This is not to say, that these informations are all correct. Could you provide the data on which you base your comment and we are more than willing to update the posting. Looking forward to hearing from you. Some interesting stuff – but some of it does get ‘lost in translation’ (ironic as it can also heighten tensions on the human interest conflicts that are a ‘bug-bear’ (pun intended) in conservation. This article is about 10 years out of date. Genetic analysis has estimated there to be between 1,000 and 1,500 bears in Slovakia and the population is probably still growing. There has been a lot of research on bears in Slovakia in the last decade, including at least 3 studies using satellite telemetry collars, and several good quality scientific papers have been published. The challenge is to help local people find ways to live with bears. Extreme views and approaches – from either side of the hunting/protection divide – do not help.